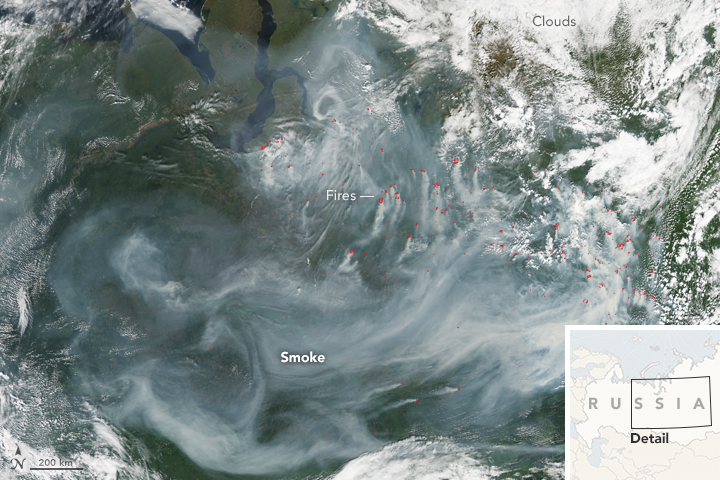 In mid-July 2016, satellites observed dense smoke over north-central Russia. 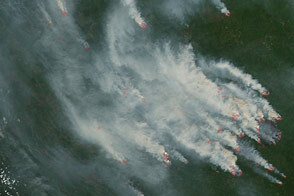 Many of the fires appeared in the tundra-taiga interface, where boreal forests give way to low-lying vegetation and permafrost. 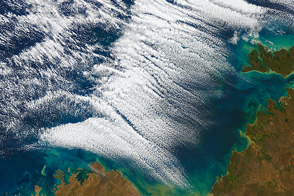 These natural-color images were acquired by the Moderate Resolution Imaging Spectroradiometer (MODIS) on NASA’s Aqua satellite on July 19, 2016. The smoke grew denser as the fires proliferated. Red outlines show hot spots, indicating high surface temperatures often caused by fire. The northernmost hotspots are likely peat fires. Peatlands cover between two to three percent of the planet’s land surface, but store 25 percent of the planet’s soil carbon, according to a paper in Nature Geoscience. Causes of the fires have not yet been identified. 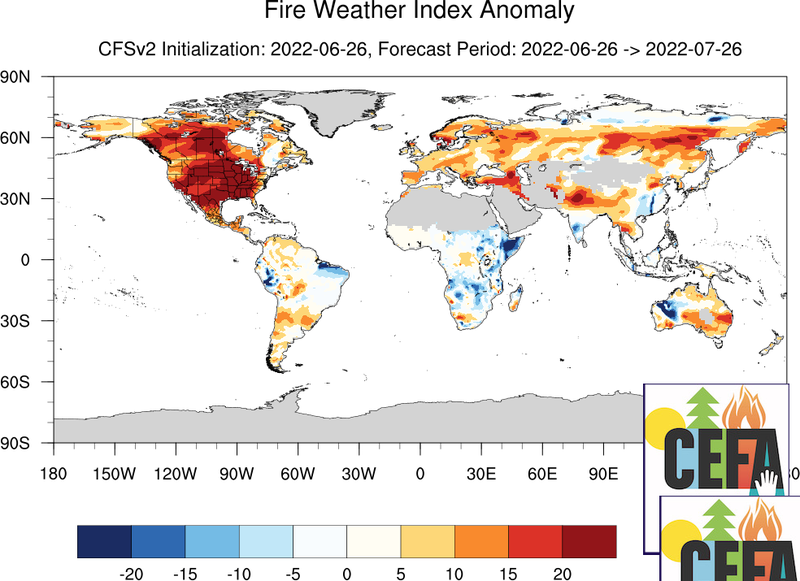 Fires in the Yamalo-Nenets Autonomous District (top-left) also stand out on the most recent global fire anomaly map for 2016. 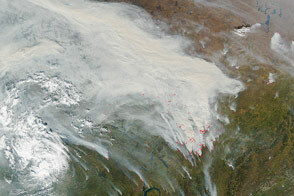 The flames burn north of the tree line (in the tundra, where low temperatures and a short growing season limit tree growth). Here, peat moss thrives, and snow blankets the ground for much of the year. The first flurries typically fall in early September, at the end of fire season. The tundra is an important carbon sink, storing greenhouse gases in its soils. But the tundra is vulnerable to rising global temperatures, which dry out peat and turn it into prime kindling for wildfire. Fires in the far north, particularly in peatlands, produce huge quantities of carbon dioxide and methane, further fueling global warming. Because of its vast scale and remote locale, the area poses challenges to field research and makes satellite data particularly valuable to researchers, noted Jessica McCarty-Kern, a scientist at the Michigan Tech Research Institute. “In order to know what’s going on in the entire Arctic, you can’t leave out Russia, because Russia is one ninth of world’s landmasses,“ said McCarty-Kern. Russia spans a much larger Arctic area than Alaska, Canada’s Nunavut and Northwest Territories. 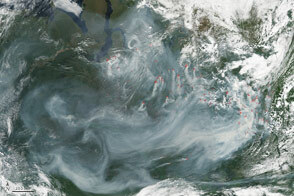 Fires hinder the ecosystem’s ability to hold carbon. The blaze produces huge quantities of CO2 and methane (a potent greenhouse gas) into the air. Instead of holding carbon, the ground releases it, further warming the earth. The autonamous district is home to the Yamalo-Nenets indigenous people, who live a semi-nomadic lifestyle and herd reindeer. The area is also a petrostate, with massive gas and oil reserves, much like the North Slope of Alaska. Resource extraction in this area is lucrative, but it alters the landscape. Infrastructure like roads and pipelines can reduce the amount of soil moisture, making the ground more vulnerable to peat fires. 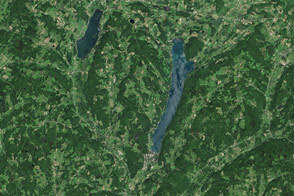 NASA Earth Observatory image by Jesse Allen and Joshua Stevens, using data from the Land Atmosphere Near real-time Capability for EOS (LANCE). Caption by Pola Lem. 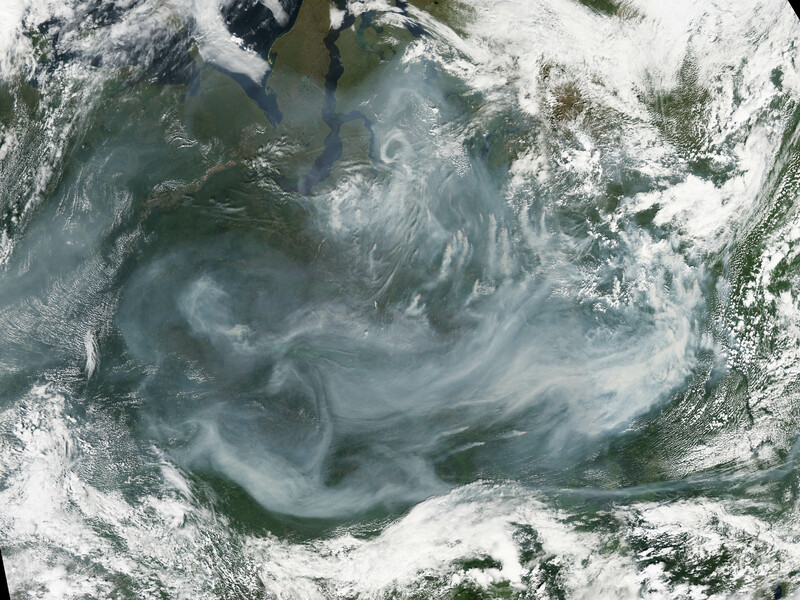 In mid July 2016, satellites observed dense smoke over the boreal forests of north-central Russia. 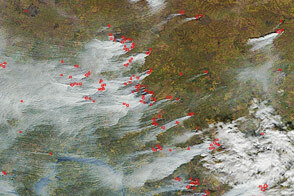 Wildfires burned across Russia amid an active 2016 fire season. Forbes, et al. (2009, October 28) High resilience in the Yamal-Nenets social-ecological system, West Siberian Arctic, Russia. Accessed July 21, 2016. 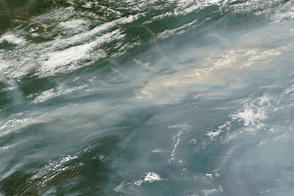 Ministry of Natural Resources and the Environment of the Russian Federation (2016, June 16) Ministry Head Sergey Donskoy Sent Telegrams to the Heads of a Number of Regions of Siberia and the Far East Warning of High Fire Danger Accessed July 19, 2016. Northern Eurasia Future Initiative (NEFI) (2016, June 22) Facing the Challenges and Pathways of Global Change in the 21st Century. Accessed July 21, 2016. Ponomarev, V.N. et al. (2016, June 17) Wildfires Dynamics in Siberian Larch Forests. Forests 7 (6). 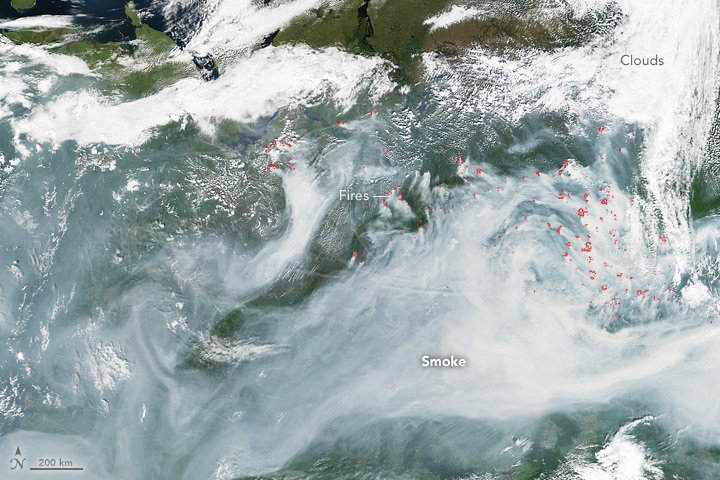 URA.ru (2016, June 29) Khanty-Mansiysk Chokes on the Fumes of Forest Fires. Accessed June 29, 2016.